Danny Philliskirk is positive about Oldham Athletic's chances of success this season after the Latics registered a fourth successive victory on Tuesday. The Latics have won four games in a row for the first time since the 2006-07 season and are now 14th in League One, seven points from a play-off spot. 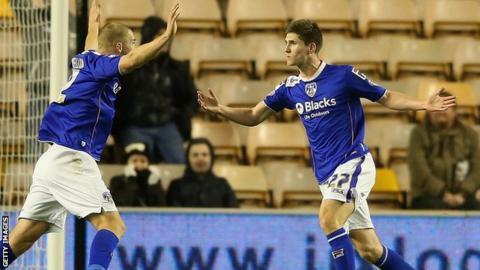 When asked if Oldham could finish in the top six, Philliskirk told BBC Radio Manchester: "I don't see why not." The 22-year-old, who has eight goals in all competitions this season, continued: "We've played nearly every team and I wouldn't say anyone's been much better than us. We've given a good account of ourselves in every game. "Shrewsbury was one of those games where we haven't played as well but we've come away with a 2-1 win. That's vital in this league. You need to make sure that, when you're not playing well, you're picking wins and points up." Gillingham and Shrewsbury have been defeated by the Latics away from home in the league, while Johnson's men have also put in impressive displays in cup wins over Notts County and Wolves. "Obviously the spirit in the camp is fantastic and we've got to know how each other plays now," added Philliskirk. "You can see that on the pitch and in the league table because we're climbing up. "Teams know what we're capable of. and we play some great football times, but we can also do the dirty work, like we showed on Tuesday night."